Lots of goodies for todays conbini monday. I almost forgot about it, since it is a holiday in Japan today. Lucky the convenience stores are all open no matter that everyone else gets the day off. Crunky, biz center stage with some nice new truffle sweets on top. Notice the o-sake sign at the top of picture also. ki no ko no yama has this caramelized almond flavor out at the moment. I havent tried these snacks from meiji yet. They look appealing but what is lying within the pack. It is supposed to be shu cream cookies. A little bit of gyu karubi and potato dog !! I must here from anyone who has tried this. Let us know what it was like, please. Green tea latte looks a bit strange, The mango yoghurt drink to the right also could be good. Friendly designs on these packs at the Natural Lawson store. Oyatsu wakame and non fried goma konbu. I went to Natural Lawson for a number of the products this week and also visited a Daily Yamazaki. It is good to be able to visit many different types of stores but still have the same Japanese conbini feel. This is the Natural Lawson store I went to for most of this weeks photos. They have some interesting products that you dont find in the normal Lawson stores. New type of macadamia chocos. There are so many chocolate covered nut sweets in Japan, but not so many people just the nuts without chocolate coated around them. A few of the items I ended up buying from Natural Lawson. The banana kitkat was quite good. The Acai energy drink great. Sakuranbo gumi needed more sakuranbo taste. At the local Daily Yamazaki, they had these wonderful tsubuan Japanese desserts. I like an (red bean paste) so these were tempting. You can eat the leaf here as well which has a fine taste. This is the sakura and anpan I bought. They both tasted great. Eating the leaf was probably the best part. How was your Conbini Monday? Had a friend from japan to bring me cup noodles and other nissin stuff. Unfortunately I gave too short a notice and she couldn’t make it to a conbini in time, and took what was in house. A mix between a “chou à la crème” and a cookie ? Very interesting ! Sorta like a healthier food type products. Anytjing w/cream cheese in it hits my sweet spot. Yea! Meiji, the Hersheys of Japan. Anything w/Rilakkuma on it, is fine w/me. Conbini Monday Wk46, Japan Japan http://bit.ly/akV8Kg More new goodies to choose from. Is that a new store that Lawson has come out with? Good to see Rilakkuma back in the swing of things as far as product endorsements. But on feminine hygiene products, now that takes the cake lol :). Everything looks quite tempting, if I do say so. Have never eaten leaves before, what type do they use ad what type of leaf are they? Couldn”t retreive your post from my RSS feed, but got it from Twitter. Is that because of that project your working on? I signed up to follow Hotoro 1.1.3 on FB you probably saw it. Just wish we could get those different types of Kit Kats over here. But no luck. Have a great week. Try not to work so hard. Just stop and smell the roses. RSS should be working. I havent changed anything on the settings recently. Let me know if you cant see other posts in future. The hotaru project is a CMS platform but I am still going to keep running shibuya246 on wordpress for now. Too much work already put in here to suddenly change 🙂 I will be starting some new projects using HotaruCMS to show what it can do though. The feeds are back up now. I was referring to the 1974 mac Davis song. will be good to see the new sakura blooms. Good luck w/the new project. I just love conbini monday! It always makes me hungry haha. Is the Rilakkuma drink straight coffee, or does it have cream/sugar? Just in catching up and doing some connection to your ever expanding list of sites. Keep up the great work, see Ya. A great Combini Monday as always. Mango yoghurt drink sounds good! You can actually eat the leaves on the goodies? I always thought it was just for decorative purposes. Not sure if I would eat one though. 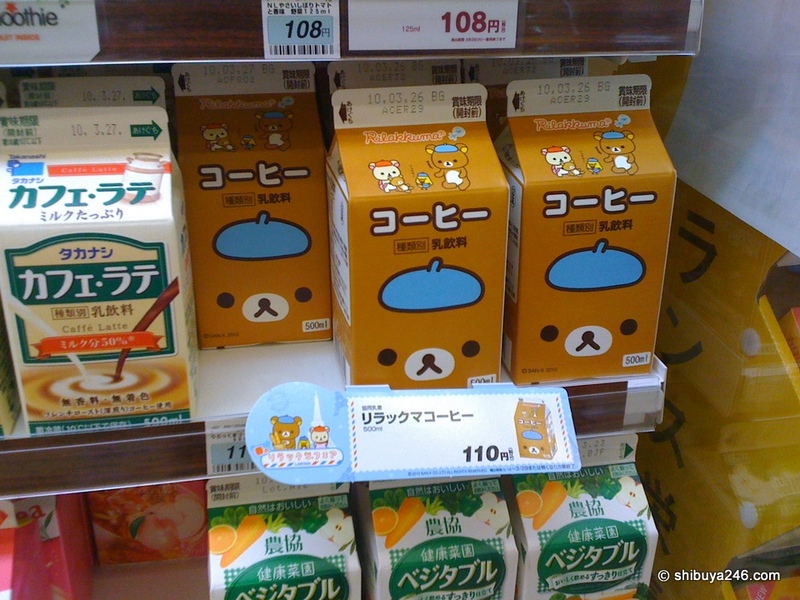 Love the Rillakkuma milk carton. We spent every morning at the local Natural Lawson on our last trip to Tokyo. It was great to be able to grab fresh fruit salad and bread rolls etc each morning to start the day. Prices were surprisingly cheap – approx. ¥300 I think for a fruit salad with Kiwi fruit, pineapple and more.